Howard Cook, Taxco 1932, Watercolor, 14"x 19.5"
Howard Cook was born and raised in Springfield, Massachusetts. He headed for New York City in 1919 with a $500 scholarship to attend the Art Students League, where he studied for two years with George Bridgman, Max Weber and Andrew Dasburg. 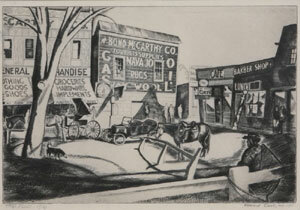 While he wasn't in class he painted outdoor billboards and worked in lithography and photo-engraving shops. In 1922 he began to work as an illustrator creating his woodcuts and drawings for magazines such as Harper's, Scribner's, Atlantic Monthly, Forum and Survey. His travel for these assignments took him to many places including his first visit to Europe. Howard Cook, Taos Plaza, Etching, c. 1926-27, 8" x 12 "
Upon his return he began studies at the Art Students League with Joseph Pennell. It was during this time that he became interested in printmaking, primarily etching, but learning woodcutting as well. It was while working as an illustrator for Forum and Century magazines he was given a commission to illustrate Willa Cather's Death Comes for the Archbishop for Forum. Being curious about the land that inspired the story, Cook left for New Mexico. He spent two months in Santa Fe before moving to Taos. 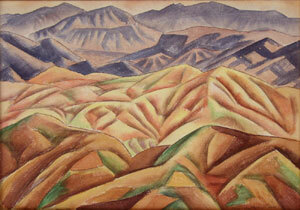 While in Taos he met and in 1927 married fellow artist Barbara Latham. 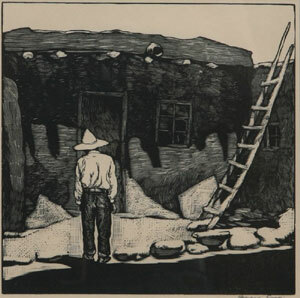 The excitement of his time in Taos was reflected in the depiction of the ceremonial dancers from the pueblos and the form and drama of the adobe structures and local landscape captured in his many prints. Also in 1927 he did a popular series of woodcuts of the Grand Canyon. The couple then travelled to Paris in 1929 so Cook could learn lithography. When they returned to New York, he exhibited subject matter which dealt primarily with the many construction projects in the city. Howard Cook, Hopi House, Woodcut, c. 1927, 8" x 8"
By 1931 Cook had his work represented four times in "50 Prints of the Year". Two Guggenheim Fellowships were awarded him in the 1930s which led to his painting for a year and a half in Taxco, Mexico to study frescos. The second fellowship took him to the American South and found him painting murals of the poverty in that area of the country. Cook and his wife settled in Talpa, New Mexico south of Taos in 1935. In 1937 he was awarded the largest mural commission ever given to a Taos artist. It was for sixteen fresco murals in the lobby of the main post office in San Antonio, Texas. The same year he was awarded the Gold Medal for mural painting by the Architectural League of New York. In the 1940s Cook's work focused on watercolors of mostly Southwest scenes. During World War II he served in the Navy in the South Pacific as an artist-war correspondent. His paintings from the war were displayed in the National Gallery in Washington, D.C. and also in a traveling exhibition the War Department funded. He was elected to membership in the National Academy as a graphic artist in 1949. 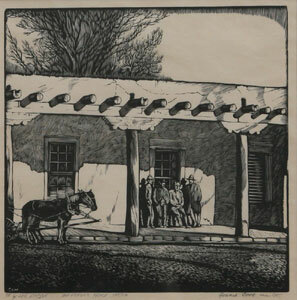 Howard Cook, For Lee Simpson, Governor's Palace Santa Fe, Woodcut, c. 1927, 8" x 8"
By the end of the 40s, Cook was painting in oil and his style had become much more abstract and consisted primarily of earth colors. He moved more toward collage by the 1950s. The Santa Barbara Museum of Art in concert with the De Young Museum of San Francisco organized a travelling exhibit in 1952 of twenty of his pastel works, which went to twenty-six museums and art centers across the country. He was the first grantee of the Artist in Residence Program at the Roswell Museum in 1967. He received the SFB Morse Gold Medal in 1976 from the National Academy of Design in recognition of his artistic lifetime achievements. The same year he was diagnosed with multiple sclerosis, and his artwork quickly came to a close. During his long career he frequently taught as a guest professor at many art schools and universities. His work continued to gain in appreciation long after he could no longer produce any art. Among the numerous museum exhibitions his work appeared in was the Working America Exhibition in 1983 at the Metropolitan Museum in New York City. A major exhibit of Cook's work opened in 1984 at the National Museum of American Art in Washington, D.C. He died in Santa Fe, New Mexico in 1980.